You’ve seen the demos. You like the idea of tracking tags in the real world to create visuals. And now you want to try augmented reality for yourself – and, incidentally, you’re a Flash developer. Building the apps themselves is easier. Fire up the framework with Flex Builder (or Flash, or Eclipse, or FlashDevelop), and you have access to all the libraries you need, so you can start playing more or less out of the box. Hello, world, indeed. You don’t have to rely on Papervision if you don’t want to. 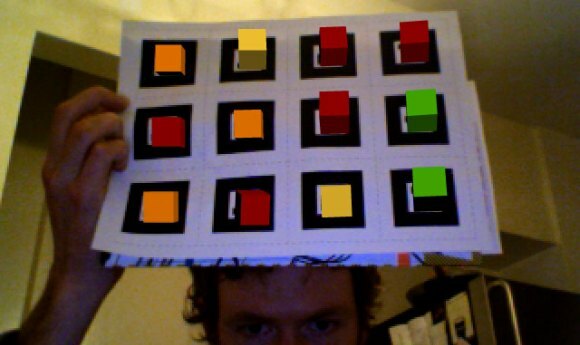 Papervision, the faux-3D library for Flash, is included with the distribution. But marker tracking is decoupled from Papervision, so you don’t have to use it if you don’t need it. Better event management. Marker adding, updating, and removal, multiple pattern detection and management, and the like are all extended in FLARManager. Great documentation. Eric has taken the time to read some fantastic getting started tutorials, all accessible from the site above so you can go play. Now, you wouldn’t pick Flash for speed – that’s not the idea. This is about the slowest implementation of ARToolkit you’ll find. But you’d use it for compatibility, because of easy deployment to the browser. Speaking of speed, the NyARToolkit Java implementation actually outperforms the original C version. I’m the last person you should talk to about writing efficient, optimized code, but I can tell you that the notion that Java is “slower” than C is simply wrong. There are a great many other, more important variables, and in some cases Java can in fact outperform C. That doesn’t mean that Java is always the right tool for the job any more than C is, though, and in fact because Java’s Garbage Collector and event scheduling aren’t really built for real-time performance, and because “native” code is suited to certain situations, there are in fact times when you wouldn’t want to use Java. Understanding the application is what really matters – and that’s why it’s nice that NyARToolkit and siblings are available for AS3, C#, the mobile Android platform, iPhone, and others. Eric doesn’t just do this to fool around, either; he works in interactive design for museums, and has what has to be one of the world’s sweetest “day jobs” – working for the legendary Exploratorium. He’s also working with Processing and the wonderful reacTIVision library on a separate project that’s working with tangible table-based interfaces; more on that separately. Thanks, Eric! If you get interesting work in augmented reality going, let us know. And if you need some inspiration, my current favorite is from our friend Marco Tempest, working with Zach Lieberman in OpenFrameworks on augmented magic.